*Alien Cruiser Heat Vent area enlarged. I don't know what they use for fuel but it looks like it sure does burn hot. What about Radiation?? 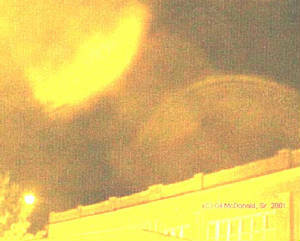 Night time photo of a cloaked 'Alien Cruiser' UFO floating over a building in Jefferson City, MO. The location is only two blocks from the Governor's Mansion. 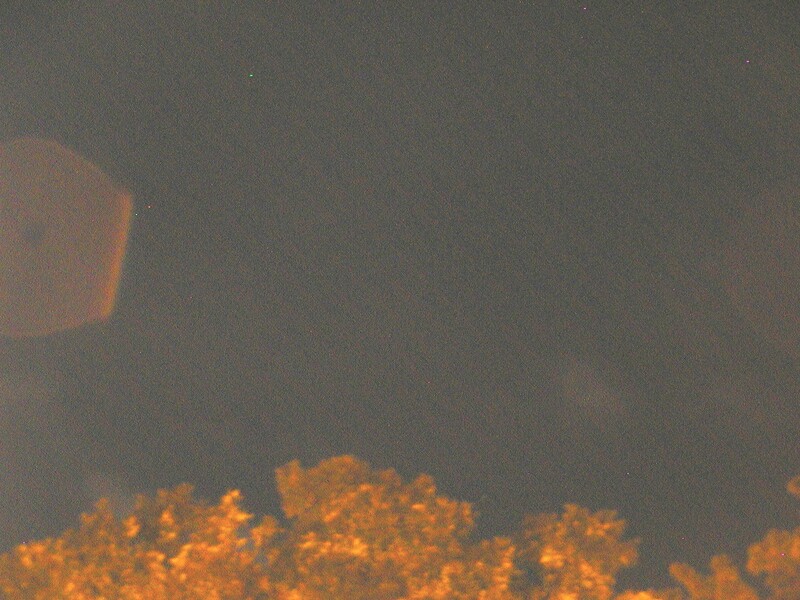 A digital camera is wonderful to work with as the cloaked UFO or it's engine signature will sometime show in the camera monitor after the photo has been taken. with Black Matter flowing from the ship to the ground. What about radiation? Several months after this photo was taken near tower #10 I had acquired a low cost giger counter and was working in tower #5. So I took this giger counter to the area of tower #5 and tested several times but was not able to pick up a radiation reading of anything above the normal level. Of course I couldn't tell if there were any ships around at the time I was testing. What about all the residents and workers who developed cancer? During the years I worked there I was personally acquainted with several employees who developed terminal cancer. I received my diagnosis in 2007. That was about five years after I retired from that job. I thought it was a high cancer area but I don't have any real statistics that will back that up. What about the people who saw 'Ghosts'? Another one of those supressed situations. If an airline pilot reports a ufo he will not be allowed to fly again. (Considered mentally unstable) If an employee at the prison reported seeing a ghost or ufo they would be fired. Same reason. One of the inmates reported seeing a ghost in his cell one night but the people in charge just laughed at him. Tall Tree -- ET or Trans - Demensional? I now have some photos of the docked Alien Shuttle Craft posted on later pages. It is well hidden & still in plain sight. With a building blocking the view of the left side, some pipes runing in front, a very tall tree above and behind, a cement stairway & a stone wall on the right side & something blocking out the lower right side it is difficult to tell what that is. The actual shape of the 'Shuttle Craft' is similar to the old fashioned child toy called the spinning top that a person would wrap string around and cause it to spin. 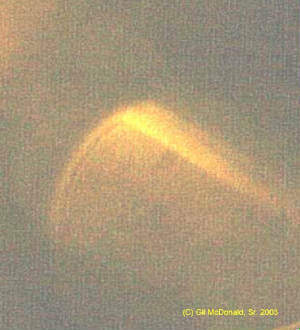 If that object is still there today and if I could show you the exact spot you would tell me there was nothing there. If you went there at night & you looked carefully you could see a light oval outward buldge in that hillside. The natural contour of that hillside is concave. The cameoflaged buldge of the shuttle craft gives the hillside a convex shape at night. I have no doubt that ship or one like it was parked there for months & I overlooked it each time I looked that direction until that one night when for some reason it floated out from behind that building on the left without being cloaked. It was visible & I was ready. 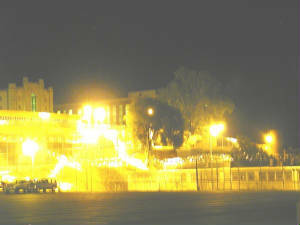 There was one night when I was on duty in tower #10, I was sitting in the tall chair that is provided and I dozzed off. As my head nodded to one side I woke and opened my eyes looking straight at that hillside below two gate. It was all raw dirt with the tall tree at the top but I didn't see the shuttle craft. The rocks and grass had disappeared and it was all raw dirt. At the bottom of the hill and to the right there was a tunnel into the hill that was large enough to drive a large pickup into. I could see about thrity feet into the tunnel but it was just more raw dirt and I didn't see anything in there. In three or four seconds the hillside had returned to its normal appearance. Is there really a tunnel at that location? Was that another dimension? I walked around and went outside the door to stare at the hillside but nothing else happened. Since that night I have learned a great deal about the aliens but not nearly enough. Eventually I stopped my research at that location & began to make preparations to get this massive amount of information out to the general public. There are many other places where I can continue my research. A lot of this is beyond my comprehension but it is as real as anything that I have known during my lifetime. By the way, my first UFO sighting was of a classic 'Mothership' in the summer of 1970. 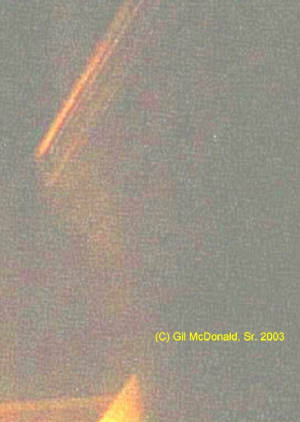 It was at low altitude (over Lake Worth) just outside of Fort Worth, Texas, This is not a new thing for our planet. Night photo Alien Cruiser floating over building. Heat Vent Shields retracted giving a flat appearance to one area of the rim.CLICK to enlarge.